'Kung Fu' was the ultimate martial arts television series that had evolved into a few movies and other adaptions. 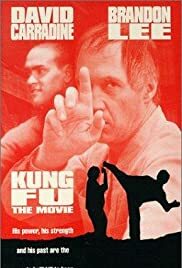 This movie starred David Carradine, and I saw it on television originally in the 1980s when it was first broadcast. I remember that this film was a little dry and it lacked a really coherent story and the charm that the television series offered. This seemed more modernised and more like a movie that was all about the action and the martial arts. I just thought it did not work very well. Maybe I was prejudiced because I enjoyed the television series a lot more, and I expected something different. This film just did not do it for me, and it was more involved with the action than anything else, so it suffered from a storyline, and I just did not care for the story. I think it had something to do with finding a long lost brother or son or something. Unengaging. Not as good as the series. Watch the series instead!